Global real estate services firm Cushman & Wakefield has published a summary of the first half of 2018 on the Warsaw office market in its latest MarketBeat report. 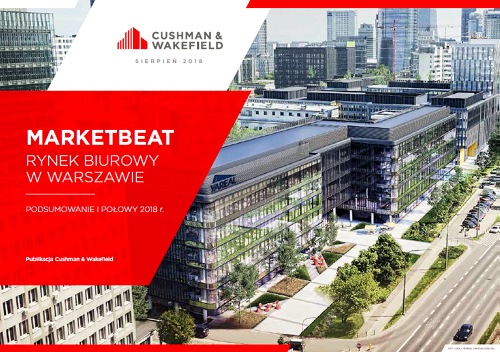 Global real estate services firm Cushman & Wakefield has published a summary of the first half of 2018 on the Warsaw office market in its latest MarketBeat report. Effects of the existing supply gap are likely to carry into 2020 when large scale office projects providing a cumulative annual supply of 430,000 sq m will be delivered. As a result, tenants are increasingly opting for pre-lets to secure prime office locations. Nearly 173,700 sq m of office space was delivered to the Warsaw market since year-end 2017, bringing the city’s total office stock to 5,410,000 sq m at the end of H1 2018. Fifteen new projects were completed. The largest office completions include Proximo II in the City Centre West, Equator IV in the Jerozolimskie zone and the Koneser complex in the Praga district. Revitalisations of office buildings are becoming increasingly common with such projects as Centrum Marszałkowska, and LIXA, being developed at the site of the former Kredyt Bank office building in Kasprzaka Street. “The trend towards revitalisation and upgrading of historic buildings continues unabated while strong occupier interest is encouraging developers to deliver such unique offices. Data for recent quarters shows that most new space coming on stream is absorbed by the market. Office schemes completed in the first quarter include the Europejski Hotel and the first phase of Elektrownia Powiśle, while ArtN and Browary Warszawskie are currently under construction,” said Anna Górska-Kwiatkowska, Associate, Office Agency, Cushman & Wakefield. At the end of H1 2018, there was 707,000 sq m of modern office space under construction, of which 567,000 sq m was in the central zone. Projects that broke ground in Q2 2018 include Central Tower. Another 50,000 sq m of office space is expected to be added to the market by year-end 2018. Absorption amounted to 148,000 sq m in H1 2018, which represented an 11% rise on the figure recorded in H1 2017. Total leasing activity rose by 8% to 424,700 sq m compared to the same period last year. New leases accounted for 65% of the leasing volume in H1 2018 while renegotiations and expansions made up 24% and 10%, respectively. Demand for office space came largely from co-working providers, including WeWork, IT and financial companies. The largest leases transacted include a 14,800 sq m lease by a public sector tenant at Piękna 2.0, Cambridge Innovation Center’s 13,500 sq m pre-let at Varso and PLL LOT’s 11,850 sq m renegotiation at PLL LOT HQ. “Due to the limited volume of office space available for immediate occupation, tenants seeking to expand are increasingly opting for pre-lets at schemes in the pipeline. In the first half of 2018, pre-lets accounted for 22% of all new transactions. As much as 12% of total office space at buildings under construction has already been secured with pre-lets. What’s more, data reveals that pre-lets account for 27% at buildings to be delivered to the market in the second half of 2018, and 10% and 11% at schemes planned for 2019 and 2020, respectively,” said report author Jan Szulborski, Consultant, Consulting and Research, Cushman & Wakefield. After H1 2018, Warsaw’s vacancy rate edged up by 0.2 p.p. to 11.1% following the delivery of nearly 150,000 sq m of modern office space in the second quarter. The city’s volume of vacant space amounts to more than 600,000 sqm, of which 432,000 sq m is in non-central locations and 167,600 sq m in the central zone. Prime headline rents stand at EUR 23.5-24 per sq m per month in the city core. Rents in the City Centre West, which is seeing the strongest occupier activity, range between EUR 17-19 per sq m per month. Office rents remained relatively flat at EUR 13-16.5 per sq m per month in non-central locations. “Market indicators for the first half of 2018 are clearly pointing to a shift in the bargaining power of tenants and landlords on the Warsaw office market, which is becoming increasingly landlord-led. The downward trend in base rents came to an end while some prime micro-locations are seeing increases in rental rates, driven by lower office supply in 2017 and robust occupier demand. We expect demand to outstrip supply, leading to downward pressure on vacancies, until the second half of 2020 when several large scale office projects will be delivered to the market. The limited office space offer and the ongoing improvements to Warsaw’s road infrastructure are likely to benefit office schemes located in Służewiec of the Mokotów district. In the first half of 2018, Warsaw continued to attract strong interest from serviced office and co-working providers who are continually expanding their footprints in newly-opened locations. Strong demand is also being driven by the SSC/BPO sector and expansions by Warsaw-based tenants,” said Piotr Capiga, Associate, Office Agency, Cushman & Wakefield.